I am a fast reader. I gobble my books down like a handful of popcorn, barely bothering to chew. Observant readers of this blog may have noticed the rapid movement of titles in my "What I'm Reading" list. For me, reading is a reflex, an addiction. My automatic response to an empty moment is to reach for a book, and race my way through it at top speed. This means that I consume a lot of books (good). But it also means that I don't absorb what I read (bad). A couple of weeks after I've finished a book, I struggle to remember exactly what happened. And this weekend I realised that sometimes I struggle to recognise what's happening even while I'm still reading! You see, this weekend I went to yoga camp (good). I only brought one book with me (bad). By the second evening I had only one chapter to go. Cue panic! I finished the book. It was William Golding's The Inheritors, his novel about a group of Neanderthals and their first encounter with homo sapiens. The Neanderthal protagonist doesn't understand a lot of what he observes - to him, the homo sapiens' boats are logs, their bows and arrows are bent sticks and twigs. Most of their actions are incomprehensible to Lok, who watches dumbly, confused and frightened. After I finished the book, I dimly realised that something Very Bad must have happened. But I couldn't quite remember it happening. I had to go back and reread the last few chapters to pinpoint the exact moment of the Bad Thing. And sure enough, I found it. But like Lok, the first time round, I hadn't understood what I was seeing. Lok had some excuse: he is a Neanderthal. But I was just reading too fast. If I hadn't been at yoga camp, I might not have taken the time to reread; I might have just moved on to the next book. Perhaps this is the true lesson of yoga camp: slow down. Be mindful. Pay attention. Take the time to digest what you're reading, and be nourished by it. Yay! The boys had a win this weekend. Enjoy it while it lasts because we probably won't be hearing 'Sons of the West' very often this year. He's tough. He's our captain. 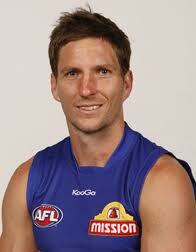 He gets hold of the ball a LOT - which makes him a great Dream Team/Supercoach pick. 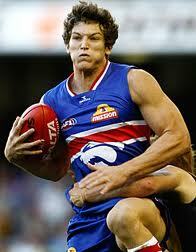 Also he came third in the Brownlow last year, so he is obviously very good. But sometimes (very quietly) even though he gets the ball a LOT, he doesn't always do great things once he's got it... sometimes he tends to give it to the opposition... but he is still very good. Very good indeed. Ahem! He was a dead set superstar, bursting out of the packs at explosive speed, breaking the game wide apart... But now his knees are buggered. He can still do it, but only in spurts. Which is a real shame. But even half of Adam Cooney (COOOOOON) is still better than a whole of most players... Has ginger hair and tatts all over one leg - a leg sleeve? A leg warmer?? Noice. GriffEN. Not GriffIN. Get it right! Another dead set superstar, but a largely undercover one. If he played for Collingwood or Carlton, people would never stop raving. As it is, he's like Batman in Bruce Wade disguise. Ssh! Don't tell anyone how good he is. Or they might try to steal him... No, wait, he's just signed a contract for the next few years. Loyal and modest as well as talented. What's not to love? Look at him! He's a tall, skinny, Tasmanian baby. 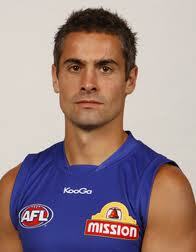 He has the hardest job in the AFL. Now that Big Bad Bazza has retired, Jones is the Bulldogs only tall lead-up forward (ie he's expected to mark the ball in the goal square, or somewhere nearby, and kick a goal). But now he has two or even three opposition defenders trying to stop him. Not easy. Also, he is a fantastic mark but a slightly wobbly kick. He is the future -- as long as he doesn't get burnt out first. Fingers crossed. I spent quite a bit of time over the Easter holidays being driven around Victoria and staring out at the landscape through the car window. And I got to thinking -- you know those amazing apps where you can point your phone at the night sky and it tells you what constellations you're looking at? Or that one where you point it at a building and it tells you all about its history? Wouldn't it be wonderful if there was an app that you could point at a landmark, a mountain or a lake, and it would tell you the Dreaming story that belongs to that place? It wouldn't have to give away anything secret or sacred, just the stories that children are told, just the absolute basics that anyone can know. Wouldn't that add an incredible depth to our appreciation of country? Imagine if all those invisible stories suddenly became visible; if we could all be helped to 'read' the landscape the way the first Australians can. Okay, it's three weeks into the season and we are 0 for 3. We are officially rubbish and it's officially going to be a long, long year. But at least being crap gives you lots to moan about in football conversations, and supporters of other teams can afford to be kind and sympathetic when your team is going badly. They get to enjoy that warm glow of satisfaction that at least their team is higher than yours on the ladder. The CBCA 2012 Shortlists were announced yesterday. It was a slightly surreal situation. At the time of the announcement I was attending my monthly kid lit book group with a group of fellow authors, aspiring authors and lovers of books for young people. One of our number brought in the long lists, released that morning, which members of the group fell upon with the eagerness of a gaggle of gulls on a handful of spilled chips, poring over the lists for a sight of our favourites and friends. After that initial flurry, we were very restrained until the end of our meeting, whereupon the owner of the iPhone tried to find out who had made the shortlists. Couldn't get through... We wandered through the Convent toward the ladies' loos, still trying. No luck. I was actually in the bathroom when someone texted congratulations! and that was the first I knew that Crow Country had been shortlisted. Congratulations indeed to all those on the shortlists and the Notable Books. There are so many worthy and deserving titles each year, there is almost always a little frisson of disappointment when a personal favourite isn't listed. So let's just take a moment amidst the celebrations to remember the other books that deserved be recognised, and congratulate them too. 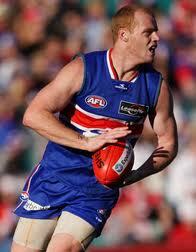 Well, AFL Round 1 has come and gone, and with it the Western Bulldogs' first defeat of the season. From here it might look as if it's going to be a long year - and it probably will. So I'm going to make it easy for you to bluff your way through supporting the Bulldogs in what they call a 'development year' (which means we're going to be pretty terrible, but hopefully not forever). He's smart, he's graceful, he's quick, he's creative. The thoughtful person's footballer. Played up forward until his knees got dodgy, now plays down back, which hopefully means he'll play for a few years longer. Writes a funny, sentimental, articulate column in The Age on Thursdays. The de facto guardian of Bulldog history. Puts little notes in the lockers of new players. Son of club legend Tony Liberatore slotted almost instantly into the midfield. Plays with more toughness and poise than you'd expect from a second year player. 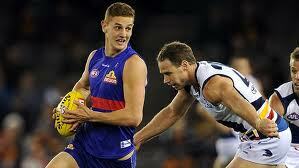 Despite performing solidly in almost every game last year, he failed to attract a Rising Star nomination. Disgraceful. Aka Big Will, Wilbur, Minno. Multi-talented and reputedly very intelligent, he speaks German, plays the saxophone and is fond of a purple suit. With the retirement of Ben Hudson, Will becomes the club's number one ruckman (the guy who hits the ball out from the centre bounce). 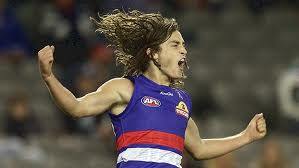 Cruelly overlooked in the main draft, he was picked as a rookie last year by the Dogs and has repayed their punt in spades. A pocket dynamo, the energy level of the team lifts as soon as he sets foot on the field. And just check out those dreds! 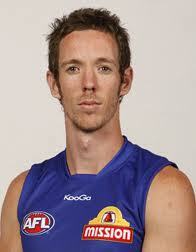 Nicknamed 'Grommet' by Bob Murphy because he comes from Ocean Grove, he is apparently not, in fact, a surfer.